This is a full french version of Harmy’s STAR WARS - DESPECIALIZED EDITION REMASTERED. It is based on the v2.1 version. French subtitles on Greedo sequence based on a french 16mm reel. a 5.1 audio track based on the 2.0 GOUT track decoded in Dolby Surround + the LFE track from hairy_hen 70mm mix. The only sequence that is not full quality is Greedo sequence, because I take the sequence from Harmy’s release which was already compress, I modify it to add french subtitles and I recompress it using x264. All the others sequences are not recompressed and or the same quality as Harmy’s DE Remastered release. Later will come a Blu-ray version with menus, bonus and a full quality Greedo sequence. But don’t wait for it, it will certainly take a certain time. So here it is, “La Guerre des Etoiles”. 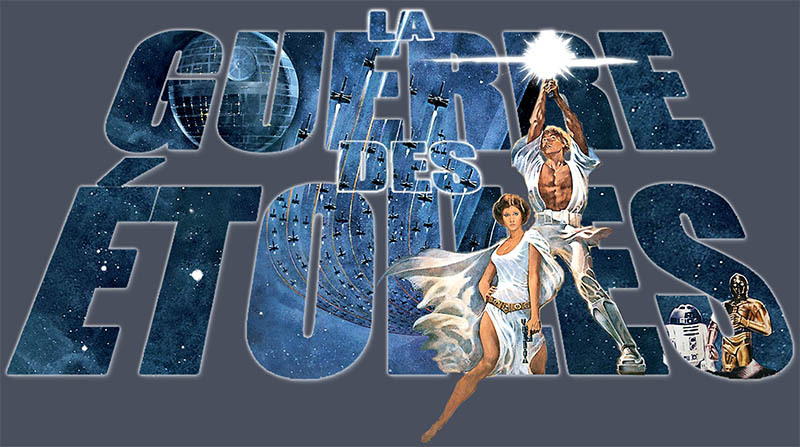 I’m french and for me “Star Wars” was always called “La Guerre des Etoiles”. My project is use to Harmy’s despecialized edition in order to make HD version of the original french trilogy. I want to make what is actually done here : <span style=“line-height: normal;”>Preserving “German” Original Trilogy</span> for the German version. Synchronize the sound of the GOUT with Harmy’s edition. The french audio is a PAL version, so the audio is playing a bit faster. And here is the V1 of french intro in HD. For the 20th Century Fox screens, I use Harmy’s video. Great project, I wish you luck. Regarding audio, the French audio from the NTSC discs is the correct speed for syncing with Harmy's video and the correct pitch for matching the French theatrical prints. PM me if you're interested. You may want to work directly with the German group, as they may have some scripts and suggestions for how to do things like the crawl text. Also you may be able to ask Harmy for a sub-free version (please give him time first to finish v2 though!) so you can add burnt-in French subs. Are the French credits different? And I also want to put in a plug for my own subtitle project (Project Threepio, in this forum), which you may find useful. "qui pourrAnt sauver son peuple" ? Pourront m'enfin! Tu vas le réécrire 100 fois correctement! 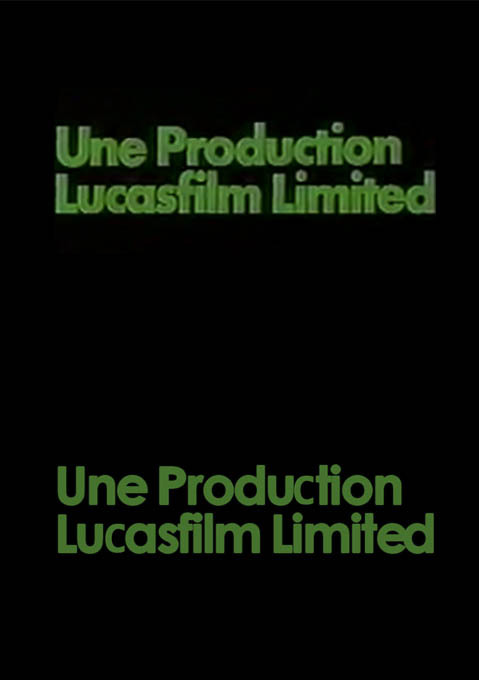 Hehe, I kid, but apart from the grammar mistake, the font used for the lucas film title card isn't quite correct and is too static and feels like video and not film. The same for "La guerre des étoiles" that pulls back in the stars. The pulling back just feels too smooth and video-ish. Perhaps someone who is more knowledgeful of these things can chime in and give advice. Cool project by the way. This deserves to be preserved, even though I personally can't stand the french dubbing! Dark Vador sounds like such a bland, old French guy! “qui pourrAnt sauver son peuple” ? Pourront m’enfin! Tu vas le réécrire 100 fois correctement! “qui pourrAnt sauver son peuple” is what is writed in the original french crawl. It’s a big mistake, but it’s here. I’m not sure if I want to correct the text. The original theater trilogy had the mistake. Hehe, I kid, but apart from the grammar mistake, the font used for the lucas film title card isn’t quite correct and is too static and feels like video and not film. The same for “La guerre des étoiles” that pulls back in the stars. The pulling back just feels too smooth and video-ish. Perhaps someone who is more knowledgeful of these things can chime in and give advice. I will write to the Germans who do the same for her version to know how they do the job. Actually I only have Final Cut Pro. I see lot of people have done the crawl with After Effects, but I don’t have it. The crawl is made with SWTSG : http://alienryderflex.com/crawl/ Si it doesn’t look exactly like the original french crawl. And I try to make the crawl in Final Cut using the 3D Object Tool, but I didn’t succed to make something nice. So I use the SWTSG tool. Are the French credits different? Would be cool to get all different intros and credits from different countries along with the soundtracks and make an ultimate version where you can choose which version to watch. I'm not into making these from scratch so I could live with the original video spliced into ie. DJ's versions or something. But good luck with your project! Oh wow, I never knew about that grammar mistake.... I guess I never bothered to look. How funny! Thats pretty much what I had planed to do with my french, german and UK laserdiscs. Someday I will, when I have the free time. I just made a better Lucasfilm screen. Here is a new Intro. I redone the Lucasfilm and "A long time ago" screens. I redone the crawl with Motion 4. The crawl is not perfect but very close to the original french crawl. Very good reconstruction. But, I think it would be better if you add a little "film-shake" to the recreated frames. Great project! Being VCR-less for basically all of the 80s, I grew up watching Star Wars on TV any time it was on, including broadcasts on Radio Canada, out of Québec. I'll always have a soft spot for the French versions, so a project like this has a lot of appeal to me. For "Il y a bien longtemps, dans une galaxie lointaine, très lointaine..." and the main body of text in the crawl, use "Trade Gothic" instead, it's a much closer match than "Franklin Gothic" you used. <span style="line-height: normal; "> </span>I just ripped the french Laserdisc, in order to have a good widescreen model for the crawl. In my country, it always had the English crawl with a narrated Czech translation. I just discovered this project on Harmy's Despecialized Edition Remastered (which I'm trying to play on my TV at the moment) project page and I'm amazed because I was wondering if we could choose an alternative opening crawl on Harmy's BD since I rediscovered the original French one on YouTube. 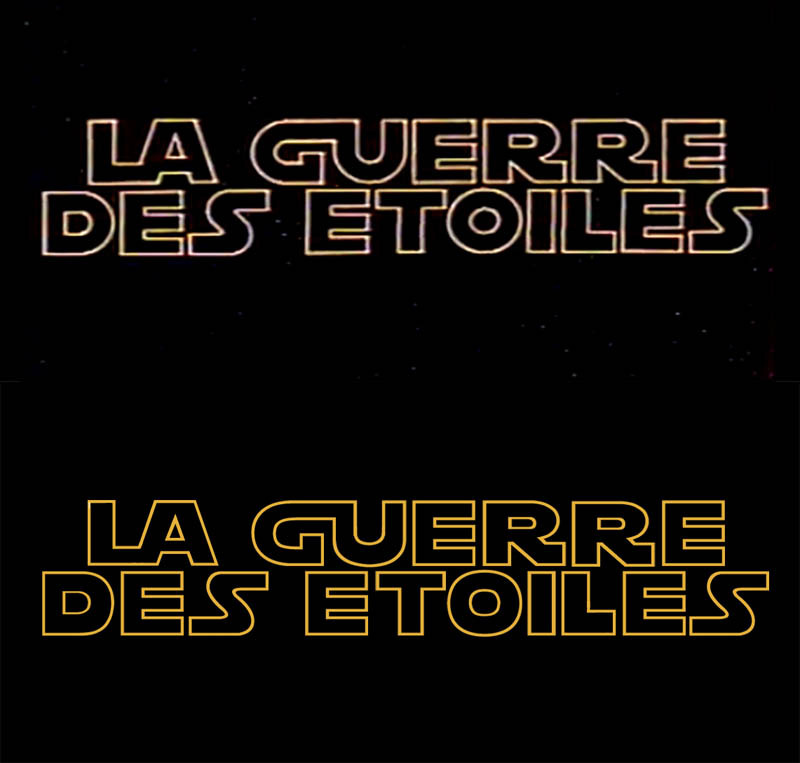 I must say I watched La Guerre des etoiles a lot in the past few months and I discovered things that make me sick from the French dub (Vader's voice which isn't Georges Aminel's, Chewbacca being called Chiktabba, ...) and so I start being used to watch it in English. Is letting us choose between French and English part of your project? 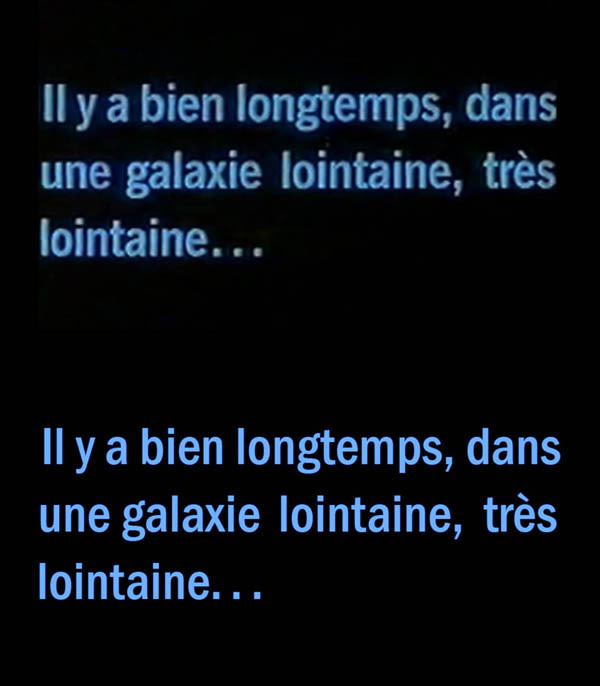 Quick question: While I remember watching "La guerre des étoiles" with this opening crawl on TV circa 1993, I watched Empire and ROTJ years later, did they also have the "La Guerre des étoiles" name or are them just "Star Wars"? "Let's face it, the Ewoks sucked, dude" -Hurley, Lost 5x13-Some like it Hoth. Please bear with me if I tend to get too excited about anything or say too much, I have issues. For the moment I only plan to make a "Total French" version as it was released in 77. I don't have the knowledge to make a BR with the 2 crawls. If someone knows about that, he is welcome. For the moment I'm finishing the "Total french" version of Q2 fanedit of the Prelogy, then I will start to work on French EP4. 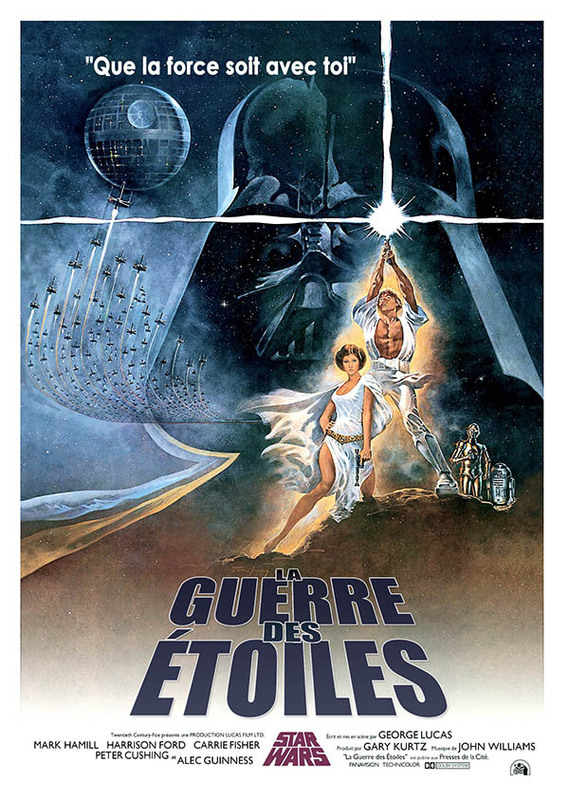 ESP and ROTJ had too the name "La guerre des etoiles" in the crawl, and so they are in the first LD release. What exactly are the differences between the "total French" and Ep4 French? Is it just a change in the crawl and end credits? PS: this is a bit off-topic but I was just reminded of Yan Solo when, right before shooting Greedo, he says, "Pauvre cave!" - it's one of those weird moments where they completely change what he said...but it works..! 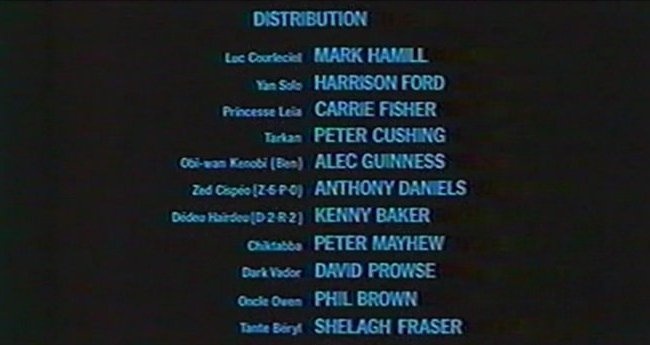 Yes, the crawl, the end credits and the french subtitles for Greedo. I really like the french translation, because if found the movie more funny in french. I like when Solo say : "Prends ta pelle et ton seau et va jouer" to Luke. Anyway, I prefer Solo french voice as the original voice of Harrison Ford. Exactly! I feel like whoever translated this film had a lot of fun doing it. It's a bit of a shame that the translations became more "literal" for the later films. Just two questions: 1) was the grammar mistake (pourrant/ont) fixed for the Ep4 crawl? 2) what are the differences between the different Greedo subtitles? Sorry to be so dim about the OT in French... I grew up with the original voices, but the French dubs have always fascinated me since I first heard them in the cinema in 97. ^ 1) As of the 2004 DVD (oldest source I have), the typo is fixed. 2) I don't know in matters of translation. I like when Solo say : "Prends ta pelle et ton seau et va jouer" to Luke. Anyway, I prefer Solo french voice as the original voice of Harrison Ford. And regarding the dubbing voice actors, it's like that in Germany... you grow up with these voices as opposed to the actors' own voices, so it feels weird when you listen to the original for the first time. And while by now I'm used to watching original versions, German dubs still are very important to me. And with something like Star Wars there's so much nostalgia in these translated versions, that it's impossible to let those go. 1) was the grammar mistake (pourrant/ont) fixed for the Ep4 crawl? The mistake is still present in the Laserdisc release. As the project is a preservation of the original theatre release, I think that the mistake must stay so. In the other hand, when I see it I always want to fix it ! The Greedo subtitle don't change, I only want to erase the english subtitle form Harmy's release in order to insert the french subtitle. Laserschwert, I agree with your speech. The french dub isn't perfect, but I grew with these voices and sentences, so I love it.